Shin Godzilla Review | Nerd Much? The monster movie genre has always seemed like it has wanted to have a big resurgence within popular culture. While we’ve made attempts at this with Hollywood’s recent Godzilla movie and the upcoming King Kong film, it just seems like one that’s never taken off in the west. However, that may change as directors Hideaki Anno and Shinji Higuichi’s give one of the most famous movie monsters a proper return and deliver and incredibly fun experience. Brought to you by the Toho Company, Shin Godzilla is the 29th film in this franchise and it brings together a great mix of old and new techniques. Acting as a reimagining for some of the early films, this new Godzilla film is about the titular beast’s first appearance on Japanese shores and the ensuing panic he causes. 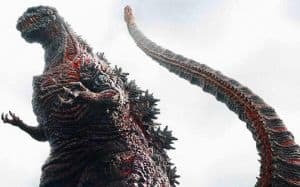 There are no other monsters for him to fight, as the film’s plot is wholly focused around Godzilla and the Japanese political system’s attempt to handle the mass hysteria and chaos he is causing. It’s a risky move to make Godzilla the sole beast, but the wonderful cast of characters help ease this burden while not overshadowing the main attraction. 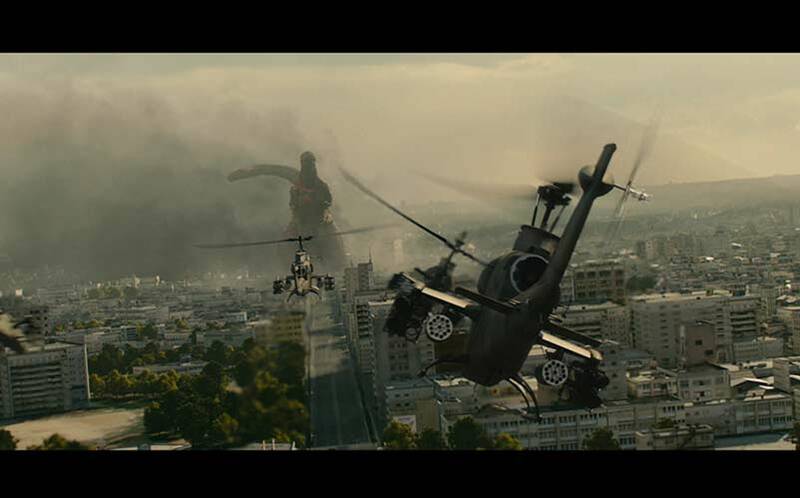 If one of your complaints was that Godzilla didn’t appear enough in the 2014 western film then you will be pleasantly surprised how much screentime he gets this time around. There is a lot more depth and social commentary in Shin Godzilla than one might expect, as the film’s plot takes shots at political gridlock, progression within the system, and Japan’s reliance on outside help for military matters. Driving the human elements this time around is Rando Yaguchi (Hiroki Hasegawa), a politician who leads the Anti-Godzilla task force and is hoping to resolve the matter without resulting to extreme measures. Hasegawa does a fantastic job in the role, and it might surprise you how well some of the softer, quieter moments work. Now that’s not to say there isn’t humor in this movie. In fact, you might even classify Shin Godzilla as part comedy thanks to the witty writing, perfect timing for jokes, and stellar editing that keeps many of the scene fresh and highly entertaining. This is a movie that’s very self-aware with what it is and both directors wisely avoid the gritty and realistic mentality that our western counterpart fully embraced. It’s because of this awareness that Shin Godzilla gets away with having a surprisingly serious discussion about how infective any real government would be under these circumstances and for a moment you may wonder what would happen if Godzilla really showed up. Though this is a Godzilla movie, and the giant lumbering beast makes his presence known early on and keeps coming back for more. His design is interesting and the progression he goes through offers just enough change to make this film feel fresh. 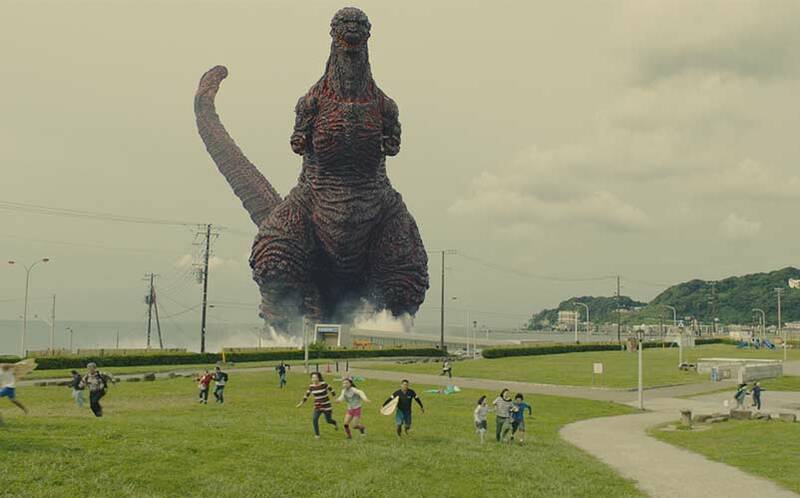 However, Shin Godzilla suffers from some pretty apparent hit or miss CGI at times, but it’s nothing too distracting or too major to knock the movie for. Embracing the camp and cheesiness is a must if you hope to fully enjoy this movie. But, that’s not to say that the more impactful moments aren’t enjoyable or dramatic, as they work wonderfully in contrasting the overall tone of the movie. This is mainly thanks to a wonderful score that does a great job mixing old and new, which truthfully is just the general concept for this movie. The action is great and thoughtfully scattered throughout, though the big climax is a bit underwhelming compared to some early scenes at the beginning of the second act. Which is a shame because it’s clear both directors have a good eye for directing combat sequences, just they aren’t always consistent with their quality. While the film isn’t always following Godzilla, much of the action and reaction is about Godzilla which helps lend focus to pretty much every motivation and character arc in this movie. Normally, this would be a bad thing, but there are enough twists and surprises that help keep many of the human actions engaging. However, you will have to slog through a rather slow second act that overstays its welcome and drags the pacing down immensely. Truthfully, Shin Godzilla could have benefited greatly from shaving some of the middle out since many of it feels like the humans are just spinning their tires. It becomes even more noticeable since the first act wastes literally no time in throwing viewers into the chaos, so the radical shift in pacing brings the entire film to a screeching halt. Shin Godzilla is a fantastic return to form for this legendary monster thanks to the fantastic cast, direction, editing, and score. Couple this with the sharp satire on the Japanese political system and their relation to the US and it helps makes Shin Godzilla one of the best in the entire series. Even with an underwhelming climax and slow second act, this was a highly enjoyable movie that does the series justice. Shin Godzilla is one of the best monster movies of the decade and should be seen by both new and old fans.